This article is a continuation of the analysis I have done on the Yuga System. Previously, in a series of articles, with the first one being titled Yugas I have discussed at length the Chatur-Yuga System of 12,000 years (Markandeya's Yuga System) and of 10,000 years (Sanjaya's Yuga System). I have also described in the Part-2 of this article-series about a 1000 Year Long Chatur Yuga. This article is about this Thousand Year Long Chatur Yuga. Which is the current Manvantara? Let us summarize the different Chatur Yuga definitions described in the previous articles (starting with the article 'Yugas'. The Thousand Year Long Chatur Yuga comes as parts of Markandeya's Chatur Yuga definition. Markandeya's defines a 12,000 year long Chatur Yuga. He defines the four constituent Yugas of the Chatur Yuga in the ratio of 4:3:2:1. Thus in this definition, Rta Yuga is 4000 years, Treta is 3000 years, Dwapara is 2000 years and Kali Yuga is 1000 years. But he also defines the dawn and eve for each of these constituent Yugas. The dawn of Rta Yuga is 400 years, that of Treta is 300 years, that of Dwapara is 200 years and that of Kali Yuga is 100 years. The total duration of all the dawns amounts to 1000 years. The duration of the eves of the respective Yugas too are same as that of their dawns. The total duration of all the eves again is 1000 years. We have seen that these 1000 year long Dawn and 1000 year long Eve were taken from a much older Chatur Yuga definition which is 1000 years long. We have also seen that this 1000 year long Chatur Yuga was arrived at by dividing the basic unit of Yuga (1000 years) in the ratio of 4:3:2:1. In a 1000 year long Chatur Yuga we have a Rta Yuga of 400 years, a Treta of 300 years, a Dwapara of 200 years and a Kali of 100 years. We have also seen that the Chatur Yuga definition that was popular during the Kurukshetra War was the one described by Sanjaya, the minister of Kuru king Dhritarashtra. This was described when the Kurukshetra war-preparations were going on. It was a 10,000 year long Chatur Yuga (Rta: 4000 Y, Treta: 3000 Y, Dwapara: 2000 Y, Kali: 1000 Y). This was arrived at by multiplying the basic unit of Yuga (1000 years) by the ratio of 4:3:2:1. This 10,000 year long Sanja's Yuga Definition was older than the 12,000 year long Markandeya's Yuga definition. In this article we deal with the Yuga definition which was much older than even the Sanjaya's definition. This could be the definition that was popular before Sanjaya was born or during the life-time of Sri Rama (of Ramayana) or even beyond that time. This was a 1000 year long Chatur Yuga Definition. The source of this 1000 year long Chatur Yuga is the basic unit of Yuga (ie 1000 years) discovered by the ancient Indian astronomers by observing the precession of the Earth's axis. This precession is visible to astronomers as the shift of the Pole Star from the celestial North Pole (or vice versa). Approximately once in 1000 years the celestial north pole changes its position from one visible star to another. Then the new star which is now closer to the Celestial-North-Pole is designated as the new Pole Star and the old Pole Star is demoted from that position. This is the basis of the 1000 year long Chatur Yuga. The Ancient Indian Astronomers had witnessed many such shifts. They have demoted many old Pole Stars and promoted many new Pole Stars as part of their observation-history spanning several thousands of years. Pole Stars are designated as Dhruva in Sanskrit, since they remain stable (Dhruvam) in the sky while other stars apparently move around it, due to the effect of the daily rotation of Earth on its own axis. During a single year or during the life time of a single individual (100 years) too there is no considerable change in the position of the Dhruva (Pole Star). Thus the Dhruva is relatively very stable. However since the ancient astronomers had the collective memory of observing many different Pole Stars, the Puranas (ancient Indian texts) speak of many Dhruvas existing in different epochs of history. The Puranas says that each epoch has a different Dhruva and a different Manu (the originator of a new civilization). The name Dhruva was also the name of an individual named Dhruva, the son of Uttanapada and the grandson of the first(?) Manu (the Swayambhuva Manu i.e. the self-born Manu). It is not clear when the name of the North Pole Star got associated with Dhruva. It can be that the Pole Star was named after the king Dhruva, or the king was given the title Dhruva for being as stable as the North Pole Star. The star Vega (Abhijit) was the Dhruva (North-Pole-Star) around 12,000 BCE (assumed to be the dawn of the Ancient Indian Civilization). From about 4300 BCE until 3942 BCE, Theta Boötis was the Dhruva. The star named Thuban was the Dhruva from 3942 BCE to 1900 BCE. It was closest to the pole in 2787 BCE. Kappa Draconis was the Dhruva from 1793 BCE to approximately 1000 BCE. Kochab and its neighbor Pherkad were the twin Dhruvas from 1500 BCE until 500 AD. Since 500 AD Polaris is our Dhruva. For details see:- Different Dhruvas. The association of the name 'Dhruva' with the North Pole Star took place during the time of one of these Pole Stars that we have discussed above. This would then mean that the individial named Dhruva, the son of Uttanapada (Utnapisthim in other cultures) and the grandson of the Swaymbhuva Manu (Nu > Noah?) lived around 12,000 BCE, 4300 BCE, 3942 BCE , 2787 BCE or around 1793 BCE. For details see:- Human Migration and India. In the subsequent sections we shall come to a more precise conclusion. The duration between one star becoming Dhruva to another becoming Dhruva is not always 1000 years since the prominent stars (which assume the post of Dhruva) are not always equidistant. But since the astronomers had already divided the sky into 27 sectors (called Nakshatras), by using the prominent stars as a basis, they can tell the passage of a 1000 Year Long Chatur Yuga with a certain level of accuracy. We can safely assume that the ancient Indian astronomers started seeing Vega (Abhijit) since 12,000 BCE, staying unmoved at the Celestial North Pole. Vega (Abhijit) could be thus the first Dhruva. Then at least by 4300 BCE or by 3942 BCE (when Theta Boötis) was the Dhruva, they might have had full faith in the 1000 year long Yuga System. Since then, it might have established as the standard unit of time for measuring large time periods, periods larger than human lifespan(100 to 120 years). Since then, it might have then used to record every important event in the ancient Indian history. During the period from 3942 BCE to 2787 BCE or up to 1900 BCE, when Thuban was the Dhruva, they might have then put it to practical use to record historically important events which we are now able to learn from the two ancient Indian epics viz. the Ramayana and the Mahabharata as well as the several Puranas like the Vishnu Purana, the Bhagavata etc. In a 1000 year long Chatur Yuga, Kali Yuga will be 100 years long, Dwapara will be 200 years old, Treta will be 300 years long and Rta will be 400 years old. In this case most of the events of Mahabharata will be mapped into the 200 year of Dwapara Yuga and most of the events of Ramayana will be mapped into the 300 years of Treta Yuga. The end of Dwapara Yuga is marked by the demise of Krishna. The end of Treta Yuga is marked by the demise of Rama. The beginning of Treta Yuga is marked by the birth of a king named Avikshit belonging to the Ikswaku dynasty. The beginning of Rta Yuga and the end of Kali Yuga is not marked by any specific events. A table is created and published here containing the important events that occurred in a 1000-Year Long Chatur Yuga. It contains the probable dates of the life of many personalities who are considered as having lived in this Chatur Yuga. The important among them are obviously Rama and Krishna. It contains the dynasties of the Ikshwakus, the Ailas, the Purus, the Bharatas, the Kurus, the Yadavas, the Daityas and the Danavas. It contains the probable dates of the life of kings like Mahabali, Mandhata, Marutta, Bharata, Ajamidha, Divodasa, Pratarddana, Sagara, Bhagiratha, Dilipa, Santanu, Pandu and sages like Vasistha, Vyasa, Bharadwaja and Gautama and many many more. 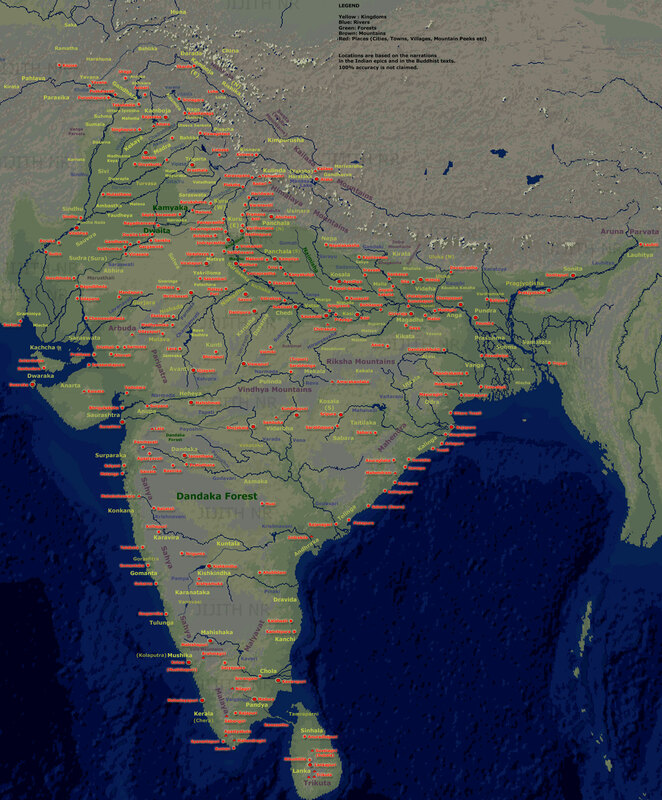 I hope this chart will be useful for all the people researching on ancient Indian history like the Ancient Indian Maps (Kingdom Map and City Map) that I have created. The 1000-Year ChaturYuga with events of Ramayana and Mahabharata. To access the file directly or link to the file, click here. The accuracy of the date is +/- 5 years. The four Yugas are given color codes. Rta: White, Treta: Yellow, Dwapara: Blue, Kali: Red. To map the events to historical dates, a date of the Kurukshetra War is to be considered. Here I have considered 3061 BCE as the date of Kurukshetra War which is arrived at by most of the independent researches. Vaivaswata Manu is considered as the origin of both the Ikshwaku dynasty (in which Rama was born) and Aila dynasty in which Krishna and the Pandavas were born. The names of kings who were not described significantly (sometimes mentioned as a name occurring only once) or those names suspected of being latter additions are removed from both the lineages. Sequential portions of the lineages were analyzed for the possibility of them being parallel, and matching cases were arranged in parallel. The sages bearing tribal name such as Vasistha are considered as extending to several generations. Mahabharata is considered as the main source of information. The Ikshwaku lineage described in Ramayana is not fully reliable as it contains several erroneous additions such as Nahusha and Yayati deliberately inserted a few generations above Rama. The lineage of Ikshwakus mentioned in Vishnu Purana and Bhagavata is more reliable than that in Ramayana. However these lineages too contains many later additions. The Ikshwaku Lineage mentioned in Hari-Vamsa (appendix of Mahabharata) and that in Vayu Purana too were considered for the analysis. Interestingly enough, the death of Rama precedes the death of Krishna by 200 years, if we consider that Rama died at the age of 70 and Krishna at the age of 80. Not a normal age of death, if we consider that many ancient men like Bhishma (lived close to 95 to 105 years) and Vyasa (lived around 120 years) were long lived. This 200 years is also the duration of the Dwapara Yuga. Arjuna's grandfather's grandfather viz. Pratipa was 20 years old when Rama died. Nala lived in Kali Yuga and was a contemporary of Arjuna's grandson's great-grandson Aswamedhadatta. Kalmashapada (Saudasa) was a contemporary of Rama's sons Lava and Kusha. Hiranya Kasipu and the first Indra were contemporaries. Prahlada and Vaivaswata Manu were contemporaries. Pururavas and the great Daitya king Mahabali were contemporaries. Vitahavya and Divodasa of the Ikshwaku line and Bharata of Puru line were contemporaries. They ruled along with Avikshit whose birth marks the beginning of Treta Yuga. Ikshwaku king Raghu and Bhagiratha were contemporaries. Tapati, the wife of Samvarana (of Bharata line) probably married the daughter of an Ikshwaku king (described as Surya) in the south who was a contemporary of Raghu ruling at Ayodhya. Samvarana's son was the famous Kuru the founder of Kuru dynasty. The Kurukshetra war hero Vrihadvala and his father Suvala, brother Sakuni and sister Gandhari were all descendants of Rama's brother Bharata. Vaisampayana narrated 'Bharata' to Janamejaya 75 years after Sanjaya narrated 'Jaya' to Dhritarashtra. The crucial formative period of Mahabharata was thus 130 years. It grew even after that with additions to Santi Parva, Anusasana Parva and Vana Parva and also with minor modifications and additions to other Parvas as well. The same Valmiki, who was an elder contemporary of Rama authored the first two versions of Ramayana. The first version was completed soon after Rama returned to Ayodhya after killing Ravana. The second version was created after Sita was banished from Ayodhya and reached Valmiki's hermitage. The third version was created after the death of Rama, probably by some descendant of the original Valmiki. Ramayana underwent several modifications which continued even after Mahabharata grew into Sauti-Saunaka dialog. Based on the two different theories that I have proposed in this web-site (AncientVoice), one in which a Chatur-Yuga is 10,000 years long (Theory-1) and the other in which a Chatur-Yuga is 1000 years long (Theory-2), the date of the birth of Rama differs. Theory-1 is detailed in an article-series containing 13 articles, starting with the article titled Emergence of the Yuga System. Theory-2 is proposed in this current article. Based on Theory-1, the date of birth of Rama comes to around 5100 BCE with an error margin of +/- 100 years. Based on Theory-2 (expressed in the current article) the date of birth of Rama comes to around 3296 BCE with an error margin of +/- 5 years. Based on Theory-1, the interval between the life of Rama and Krishna is 2000 years, which is also the length of Dwapara Yuga as per this theory. Based on Theory-2, the interval between the life of Rama and Krishna is 200 years which is also the length of Dwapara Yuga as per this theory. The length of Dwapara Yuga (and all other Yugas) differ by a multiple of ten between Theory-2 and Theory-1. This is not an accident but the consequence of the definitions of Chatur Yuga, that I have explained in detail in articles dedicated to the respective theories. Theory-1 is in close agreement with the Archeo-Astronomy based date of 5114 BCE arrived at by using the Planetarium software. Reference:- Historical Rama by D K Hari and D K Hema Hari in the web-site, Bharatgyan. The efforts put in and the works of these two individuals and their endeavour to collate and disseminate information on the knowledge of India through the ages is highly laudable. What I look forward is to know about the error-margin in the calculations arrived at by Bharatgyan. It is of interest to me to know about the other dates (both before and after 5114 BCE) arrived at using the Planetarium software they used which is not in full but partial-agreement with the descriptions of sky (with stellar and planetary position) found in Ramayana. I am of the opinion that importance has to be given to partial-agreement dates and error-margins as well. I also would like to see if the Ikshwaku lineages mentioned in Mahabharata, Harivamsa, Ramayana, Vishnu Purana, Vayu Purana and other Puranas have sufficient length (duration) to account for the 2000 years of gap between the life of Rama and Krishna. Considering the fact that both these lineages started off from Vaivaswata Manu, the probability is low that this is indeed the case. It is evident that many kings were added into the Ikshwaku lineage as a latter addition. But it is equally likely that several other kings are omitted or forgotten in the course of time. This dark-matter (ie unknown kings) together with the possibility that the lineages of sages like Vasistha extended in generations as several Vasisthas by can perhaps explain the long gap. More research will be needed to make a final conclusion. Theory-2 is in partial agreement with an analysis done by Smt. Satya Sarada Kandula in the web-site AncientIndians. However, she has not given any exact date of birth for Rama. She took into account many individuals mentioned in Rama's life, such as Parasurama, Jambavantha, Hanuman, Vibhishana etc as also present during Krishna's and Pandavas' life. Based on the lineage of Vasistha-Sakthi-Parasara-Vyasa she considers Rama to be a younger contemporary to Vasistha's great-grandson Vyasa. Since Krishna is contemporary to Vasa's grandsons viz. Arjuna and other Pandavas, she considers Sri Rama to be of the grandfather generation of Sri Krishna. She has also taken into account the disciple succession of Parasurama-Agnivesa-Drona. In the table, which was the final result of my analysis (see section:- Research done for creating the Table), I found Rama to be an elder contemporary of Vasistha's son Sakthi. I guess Sakthi was born to Vasistha when Rama was in his 14 year exile, and when Rama's age was around 30 years. Since Ramayana narration always focused on Rama, the birth of Sakthi was of no significance to Valmiki. I also think Sakthi was slain by Saudasa (Kalmashapada) after the death of Rama. Since Valmiki concluded Ramayana (by its third version) with the death of Rama, he omitted this violent death of Sakthi as well. This view may change if I could find substantial mention of Vaisistha's son Sakthi in Ramayana. So far I am unable to find any mention of Sakthi, the son of Vasistha, in Ramayana. Thus by Theory-2, I am in partial agreement with Satya's theory. Instead of Rama being a younger contemporary of Vasistha's great grandson Vyasa, I consider him to be an elder contemporary of Vasistha's son Sakthi. Satya writes extensively on various topics related to ancient Indians and analysis articles on Ramayana, Mahabharata and many Puranas. All of her works like the analysis of different Yugas are highly appreciative. Only Valmiki Ramayana is considered, Tulsi-Ramayana and Kalidasa's Raghuvamsa being later works. In my analysis I have removed 11 kings mentioned between Raghu and Aja in Ramayana (vrm.1.69.17-32 and vrm.2.102.4-29). The kings thus removed are:- Pravriddha, Shankhana, Sudarshana, Agnivarna, Shighra, Maru, Prashushruka, Ambarisha (considered as part of a parallel lineage), Nahusha & Yayati (considered as willful insertion from the Aila lineage of Mahabharata and hence removed) and Nabhaga (considered as part of a parallel lineage). This is make Aja the son of Raghu which is in agreement with the Ikswaku lineages mentioned in Vishnu Purana, Bhagavata, Mahabharata and Harivamsa. One of the factors I have considered in arriving at the table is the mention of the Kuru capital Hastinapura in Ramayana. 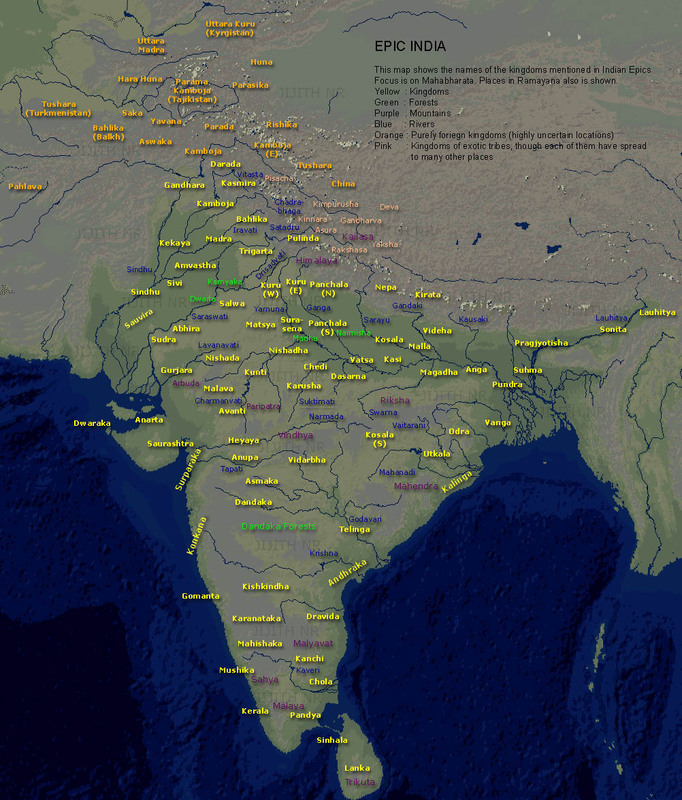 The Kuru tribe was the focus of Mahabharata to which the Kauravas and the Pandavas belonged. In Ramayana, Hastinapura is mentioned as part of the journey of messengers from Ayodhya to Girivraja, the capital of Kekaya to call back Rama's brother Bharata. (VRm.2.68). This put an upper limit to the life-time of Rama, since the founder of Hastinapura, king Hasti is a forefather (grandfather or grandfather's grandfather) of Kuru, the founder of the Kuru dynasty. I have also considered the mention Kuru kingdom as Kurujangala (a bush-land in Kuru kingdom, south of Kurukshetra in Ramayana in the same passage ((VRm.2.68) )and in many other passages as northern-Kuru (candidates locations include Himachal Pradesh which is to the north of Kurukshetra). This too puts an upper limit to the life-time of Rama, since king Kuru was (after removing erroneous king-names) Santanu's grandfather's great-grandfather. As per my table Kuru was a contemporary of Aja, the grandfather of Ram. Compared to Mahabharata, very less information is found in Ramayana on the terminologies related to the Vedas. In some previous articles (Ramayana & comparison-of-ancient-indian-texts), I have expressed the speculation that it could be due to:- 1) Valmiki, formerly a robber or hunter, being not associated with the Vedas unlike Vyasa who was born in the family of Vasistha, well known for his involvement in the formation of several Vedic hymns. 2) Rama's life-time coincides with a time when the Vedas were being formed but not yet completed, especially the Yajur Veda. I shall add one more point, based on the great scholar Srikant G. Talegiri's analysis that the creation of Vedas were more or less a Puru-Bharata-Kuru affair with Ikshwakus playing a lesser or no role at all. Analysis of Mahabharata also yields that Viswamitra was born in the Kusika branch of the Bharatas. Vasistha's connection with the Bharata prince Samvarana too is evident from Mahabharata. Rama's knowledge of the Vedas comes from sage Vasistha, his priest and preceptor. Rama is mentioned as trained in Yajur-Veda:- (VRm.5.35) "He got trained in Yajurveda, the sacrificial Veda." No other Veda is so explicitly mentioned in Ramayana, to my knowledge, though there are several references addressing the undivided Vedas in collective as 'Vedas'. This strengthen our view that Rama's life coincides with the Yajur-Vedic age. Another reference in Ramayana mentioning about the Vedas is in VRm.4.03 where Rig, Yajur and Sama Vedas are mentioned. Here, Rama suspect Hanuma(n), whom he is meeting first time, to be a knower of these three Vedas. It is not clear if this is a later addition or part of the original. Since it comes in a section where the Vanaras (forest-dwellers, including Hanuma(n) who was a Veda-knowing forest-dweller or Vana-vasi) are described as monkeys, there is a possibility that this is a later addition. Both the theories are in agreement that Rama was born earlier than Krishna. After the Valmiki (who lived during the reign of Rama), another descendant in his line (who obviously would be called 'Valmiki' as that being his surname) seems to have edited Ramayana. This sure happened post-Kurukshetra war, probably during the heyday of the Puranas. In tune with the Puranas which contain several magical and strange narrations, this Valmiki seems to have re-composed the Ramayana that he inherited from his forefather and portrayed the Vanaras as monkeys or as apes to make the narration more miraculous and dramatic. The language of composition too thus became more modern than that of Mahabharata. What we have now as Valmiki-Ramayana is probably this later version of Ramayana. Manvantara is a large unit of time. The definitions found in Puranas make it larger than a Yuga or Chatur-Yuga. As per Vishnu Purana it is equal to 71 Chatur-Yugas and is 306.72 million years long. Etymologically Manvantara is made of two words:- 'Manu' and 'Antara' (interval). Thus it is 'the interval of Manu' or the interval between two successive Manu-s or the life-span of a Manu. Mahabharata mentions very little about Manvantara (Manwantara, Manwantaras) (just 4 occurrences). Compare it with the number of references of Yuga (around 300). Also most of these references are from the last chapters of Santi Parva (book 12) known for its lesser antiquity. This indicates that the concept of Manvantara originated post-Kurukshetra-war, during the formative periods of Vishnu Purana and is influenced by the advent of Aryabhata's astronomy-based Yuga-system which ran into millions of years. From our analysis of the 1000 year long Chatur-Yuga, we can deduct that Manvantara and Chatur-Yuga are the same thing, ie a Manvantara is only 1000 years long. In around 1000 years, the pole-star (Dhruva) changes from one visible star to another. The information that "Dhruva is the grand-son of Manu" (real or mythological) indicates that the interval between two successive Manu-s is same as the interval between two successive Dhruva-s. Hence Manvantara, the interval between two successive Manu-s is 1000 years long and same as the 1000-year long Chatur-Yuga. If we count Manvantaras from 12,000 BCE when Vega (Abhijit) was the pole-star, then we are now living in the 15th Manvantara. We had just entered into the 15th Manvantara 11 years ago in 2000 CE. Another approach to know in which Manvantara we are living is by knowing the Manvantara of Vaivaswata-Manu. Vaivaswata-Manu is the only Manu described substantially in Mahabharata. He was the son of Vivaswat (a sun-worshiping king) and the father of Ikshwaku the founder of Ikswaku dynasty. He thus seems to be a historical-person. There is one passing references to Swayambhuba-Manu (Mbh.3.179). It is in the last chapters of Vana-Parva (book 3) and is thus suspected as a later addition. The word Swayambhuva means self-born. It could also means that his ancestry is unknown. Thus he seems to be a Manu of unknown ancestry who became popular post-Kurukshetra war in Kali Yuga as he declared that "the mixed castes are to be regarded as better than the other classes". Savarni Manu is described as a sage named Savarni and Savarna four times. A fourth Manu named Swarochish-Manu is described in Santi Parva last chapters. No other Manus described in the Puranas are mentioned in the Mahabharata. They could be fictive names invented by the authors of the Puranas. As per the Puranas, the Manvantara of Vaivaswata-Manu is the 7th Manvantara and it is marked by the birth of a Kasyapa sage named Vamana, who is praised as the fifth incarnation of Vishnu. As per our analysis in this article, Vavaswata-Manu was born around 3831 BCE (and Vamana around 3746 BCE). If we assume that the 7th Manvantara is 4000 BCE - 3000 BCE period then 1st Manvantara was from 10,000 BCE to 9000 BCE, 12th Manvantara was from 1000 CE to 2000 CE and we are now living in the 13th Manvantara (2000 CE to 3000 CE). 10th Swarochish-Manu 1000 BCE - 1 CE Ancestry Unknown; A Vaishnava saint; son's name: Sankhapada. Since 1 CE it seems we don't have any Manu-s, as ancient India came under the influence of the western prophets like Jesus and Mohammad. Kalpa is much more popular than Manvantara in Mahabharata. It is repeated 53 times in Mahabharata, as a large unit of time. A Kalpa is 71x14 = 994 Chatur-Yugas long, as per Vishnu Purana which believes that a Manvantara is 71 Chatur-Yugas long. We saw that a Manvantara is same as a Chatur-Yuga. Hence the real duration of a Kalpa seems to be 1x14 = 14 Chatur-Yugas, ie 14,000 years. One Kalpa is also mentioned as half a day (Ahas) of Brahma. His night (Ratra) is also of the same duration. Thus, two Kalpas constitute a Full-Day (Aho-ratra:- Day & Night) of Brahma. Is there any astronomical significance to this? Yes! Based on our definition of Kalpa as 14,000 years two Kalpas is 28,000 years which is approximately same as the duration of precession of Earth's axis of rotation ( 26,000 years)! In article kali-yuga2 we have already analyzed the Aryabhata's definitions which got added to Mahabharata. It describes these above mentioned time-durations in terms of celestial-Yugas (Deva-Yugas). By Deva-Yuga, what is really meant is the calculations based on the motions, alignments and conjunctions of the planets. The realm of the planets (Solar System) was often described as Swar-loka (See:- the-fourteen-worlds-part2). The Devas were often described to be inhabitants of the Swar-Loka or Suvar-Loka (the Solar System or the Heaven) or the Deva-Loka. Hence the long durations in which planets align together were considered as associated with how the Devas perceive time. One revolution of Earth in its orbit around the Sun (one year) thus became a day of the Devas. 360 years thus became a single year of the Devas. 12,000 years of Devas were then counted a single Chatur-Yuga (12,000 x 360 = 4.32 million years). For Aryabhata this duration was the time it takes for a major planetary alignment (Mercury, Venus, Mars, Jupiter, Saturn, Moon, the ascending (Rahu) and descending (Ketu) nodes of Moon's orbit and Sun near the star Aswini (Beta-Aries)). This also gives the duration of Kali Yuga as 432,000 years (dividing 4.32 million in the ratio 1:2:3:4; Kali-Yuga thus being 1/10th of the Chatur-Yuga). A single day (Ahas) of Brahma is defined as 1000 Chatur-Yugas (4.32 billion years) at Mbh.12.230. This is comparable to the age of Earth (4.54 billion years) or to the age of Sun and Solar System (4.6 billion years). This (a single day:- Ahas of Brahma) also resembles the definition of a Kalpa, thought the word Kalpa is not mentioned explicitly. We have a clear definition of Kalpa at Mbh.12.302:- A Kalpa is defined as 4000 Chatur-Yugas long (17.28 billion years) here. This is close to the current age of universe (aprox. 14 billion years) plus a few billions of year more. Thus, it is to be noted that all these definitions of Aryabhatta differs from the duration of Kali-Yuga and Chatur-Yuga that was popular during the period of Krishna (Mahabharata era, Kurukshetra-war period) and Rama (Ramayana era). They also differ from the Manvantara & Kalpa definitions that existed before Aryabhata. In this article, I have presented a 1000 year long Chatur-Yuga (Theory-2) against the back-drop of my own theory of a 10,000 year long Chatur-Yuga (Theory-1). I have also shown the results derived and the consequences arising out of this theory. Most among them are its effect on the dating on the birth of Rama, based on a given date of Kurukshetra-war. Next is its effect on the duration of units of times like Manvantara and Kalpa. There are merits and demerits for both of these theories. Theory-1 is in agreement with the dating of Rama as born around 5114 BCE, some 2000 years before the Kurukshetra war and the life-time of Krishna, arrived at using the planeterium software. Theory-2 on the otherhand explains very well the continuation of some of the people mentioned during the life-time of Rama, into the life-time of Krishna and the Pandavas, as learned by the combined reading of Ramayana and Mahabharata. It also explains the duration of the Manvantara and Kalpa, better in agreement with the real astronomical observations of ancient people. There is also this interesting possibility that during the life-time of Rama, the 1000-Year-Long-Chatur-Yuga was popular, but during the life-time of Krishna and the Pandavas, the 10,000 years long Chatur Yuga as defined by Sanjaya became popular. In post-Kurukshetra war period, the 12,000 years long Markandeya Yuga definition could have become popular. Finally during the life-time of Aryabhara, the 4.32 million years long Chatur-Yuga based on planetary motion became popular. Thus the duration of Yuga as defined by scholars could have increased phase by phase in course of time.